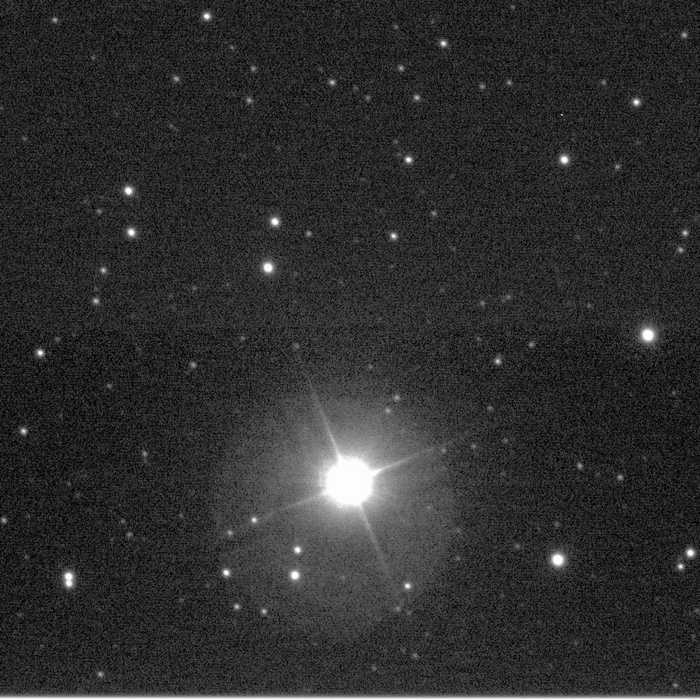 Fig 1: Liverpool Telescope IO:O Sloan r'-band acquisition observation (1s exposure time) image showing Nova Del 2013 close to peak luminosity. At 2pm (UTC/GMT) on Wednesday 14th August 2013 the astronomer Koichi Itagaki, based in Yamagata, Japan, reported the discovery of a possible erupting nova in the constellation of Delphinus (the Dolphin). The report was of a "new" star at magnitude 6.3 (almost naked-eye brightness), whereas the previous day there was no object visible at this location (down to a limiting magnitude of 13th). Following these reports, a team of astronomers at LJMU's Astrophysics Research Institute (Dr Matt Darnley, Prof Mike Bode and Dr Robert Smith) and a close collaborator at Keele University (Prof Nye Evans) requested spectroscopic observations of the system from the 2m robotic Liverpool Telescope. The immediate purpose of these observations was to confirm the classical nova nature of this object as early as possible to enable numerous follow-up programmes on other facilities to begin. 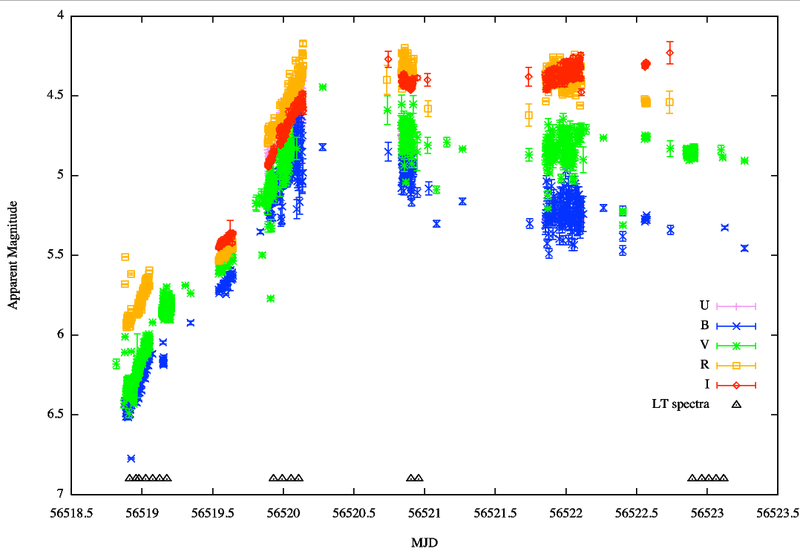 At 9:22pm (UTC) on 14th August, the FRODOSpec instrument on the LT obtained the first "professional" spectra of the system. These spectra contained strong neutral hydrogen Balmer series emission and absorption lines, with a characteristic "P Cygni" profile. Neutral Helium and singlely ionized Iron with similar P Cygni profiles were also visible. The P Cygni profile, named for the star in which they were first observed, is indicative of optically thick expanding gas. The LT spectra were used to measure this expansion velocity to be around 2000 km/s. These spectral characteristics strongly suggested that this object was indeed a classical nova in the early, optically thick, "fireball" stage. These LT results were reported rapidly via the Astronomer's Telegram system and provided the first confirmation of the nature of this object - now referred to as Nova Delphini 2013 (Nova Del 2013). The considerable brightness of the nova caused problems for many professional observatories, facilities that are designed to observe objects that are hundreds if not thousands of times fainter. As such, the observations of amateur astronomer networks, such as the American Association of Variable Star Observers (AAVSO), become invaluable. The AAVSO light-curve of Nova Del 2013 shows that the nova peaked at around magnitude 4.3 at approximately midday on 16th August. Since then the outburst has plateaued at around magnitude 4.8. This means that, in good conditions and with dark skies, Nova Del 2013 is still a naked-eye object. This is the first naked-eye nova since the eruption of KT Eridani in 2009, whose peak brightness was in fact overlooked until after discovery when previous observations of that part of the sky were searched, including those from the LT SkyCams. The progenitor system of the Nova Del 2013 outburst appears to be the previously unremarkable star USNO-B1.0 1107-0509795 which, prior to the current outburst, had a magnitude of about 17th. During the outburst, the luminosity of this system has increased by over 12 magnitudes, or by a factor of ~100,000! The outburst of a classical nova in this system indicates that this star is in fact a close interacting binary system. Extensive monitoring of the nova continues with the LT as the explosion evolves.